Honey is our new medical drug! How does this sound? Well, here is my 2 cents: It’s recognizing the perfection of nature. We have always been using honey to treat wounds. It was used as a topical antiseptic for at least 5,000 years and today it is recognized as one of the best products to heal infected wound. At some point in history we said synthetic products are better and work faster. And they were. But the microbes of these days seem to be stronger and undefeated. It’s a crises we call “antimicrobial resistance”. Only that nature is always here to help us. And won’t fails us now, either. Conventional medicine has taken honey, this amazing natural product, sterilized it and turned it into medical honey. They call it an engineered honey. Surgi comes from “surgical”, honey is just honey, RO comes from “reactive oxygen”. It’s a CE licensed sterile product, an antimicrobial wound gel indicated for all stages of healing on a wide range of acute and chronic wound types, including leg ulcers, pressure injuries, burns and surgical wounds. It can be used for both prevention and therapy. Numerous research and case studies have proved it to be non-toxic and effective when used topically in the treatment of chronically infected wounds. It’s natural, it’s safe, it’s effective. It is produced by Matoke Holdings and SurgihoneyRO™ Ltd, from the United Kingdom. 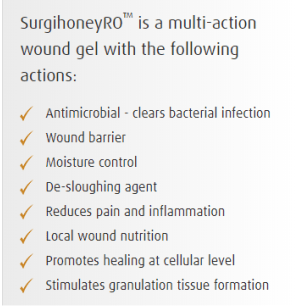 SurgihoneyRO™ is an antimicrobial wound gel approved for clinical use in the UK, Europe and Canada. It has a EU CE mark and proven safety and efficacy profile. This topical wound gel has its roots in discoveries made by founder Ian Staples and research groups in Ireland and the UK which led to novel insights into the role of Reactive Oxygen® as a natural, antimicrobial defense mechanism. Surgihoney is not currently available to buy over-the-counter in chemists or online, but can be ordered on the producer’s website. It is currently available in sterile 10g sachets and new easy-to-use 20g and 50g tubes, which have been rebranded SurgihoneyRO™. What is SurgihoneyRO™ made of? What’s its source? Any type of honey. Not manuka honey, like the other medical grade honey we know of. The producer says it is simple raw organic honey that they receive from different farms. Then the engineering part follows: the honey is tested to be clean, free of antibiotics, chemical fertilizers and pesticides. Then it is sterilized using gamma-irradiation in order to kill all microorganisms that might be present within. Residual microbial spores (clostridial spores sometimes found in honey), but also good bacteria present in some fresh honeys (what it is known as “probiotics”). Doesn’t it destroy the good qualities of honey? Gamma rays are a form of electromagnetic radiation—like x-rays, but with higher energy. The radioisotope cobalt 60 is used as the energy source and the irradiation process takes place in a specially designed cell. Gamma rays kill bacteria by breaking the covalent bonds of bacterial DNA. The unit of absorbed dose is kiloGray, expressed as kGy. The absorbed dose is determined by product density, pack size, dose rate, exposure time and to some degree by plant design. Gamma irradiation is a common method used for sterilizing medical devices and pharmaceuticals (see here a list with the most common things sterilized by this method). Doesn’t gamma irradiation change the properties of honey? It does. Any kind of treatment causes chemical changes in food. To different degrees. According to a study published in 2014 by Hussein S. Z. et al., “Does gamma irradiation affect physicochemical properties of honey?“, gamma irradiation does some changes in the composition of honey. – Some parameters increased significantly: color intensity and vitamin C content. Considering that this honey is used externally, not internally, these changes do not affect the wound healing properties of honey. Does gamma irradiation change honey’s antibacterial power? No. The study conducted by Peter Molan in 1996, entitled “The effect of gamma-irradiation on the antibacterial activity of honey.“, showed that there was no significant change found in either type of antibacterial activity of the honeys studied, peroxide activity (in two honeys with antibacterial activity due to enzymically-generated hydrogen peroxide) or MGO induced activity (in three samples of manuka honeys). The honey samples were tested for a hard-to-kill bacteria, Staphylococcus aureus, before and after gamma irradiation and showed no significant change in either type of antibacterial activity, even when the radiation was doubled (to 50 kGy). What is the difference between Surgihoney and the other types of medical honey present on the market? – Low water content – High sugar content. High osmolarity. all of them are more detailed in the article: What gives honey its antimicrobial power? These 2 antibacterial ways of action differentiate the medical grade honeys existing on the market. · Berringa Antibacterial Honey produced by Australian Organic Honey Company. · LifeMel honey, produced at Zuf Globus Laboratories Ltd, from Kiryat Shmona, Israel, which is used only internally, to prevent the side effects of chemo and radiation. The producer has created other medicinal honeys: RelaxMel, GastroMel, LadyMel, LadyMel Night, EnergyMel, BronchoMel, LaryngoMel. Wound repair is a complex, dynamic, and interactive process involving a variety of cells, soluble mediators, and extracellular matrix components, implicated in the processes of coagulation, inflammation, angiogenesis, re-epithelialization, fibroplasia, and contraction. Our body knows how to heal a wound. And whether the wound is a paper cut or a large incision following surgery, wounds will heal faster, better and with less scarring when there is plenty of oxygen available. The oxigen is needed for the generation of reactive oxygen species (ROS), which regulate a number of different cellular functions including differentiation, proliferation, apoptosis, migration, and contraction. ROS are small oxygen-derived molecules that are either oxidizing agents or are easily converted into oxygen radicals. They react with a variety of molecules including other small inorganic molecules, carbohydrates, lipids, proteins, and nucleic acids. ROS are considered to be also bad (as major contributors to cell damage during the ageing process) but also good. The concerted production of large amounts of ROS by immune cells is of great importance for effective host defense. ROS (in low concentrations) are involved in a myriad of physiological cell signaling pathways, referred to as redox signaling pathways. There is also increasing evidence that ROS are crucial for wound repair, not only as germicides but also for cellular signaling. Recent studies show that ROS kills bacteria by physically disrupting the cell membrane and DNA. This study from 2017 shows the functional role of ROS in the healing process. Low concentrations of H2O2, considered ROS, are produced by our body (after metabolizing sugar or carbohydrates.) and used at wound healing, too. How does H2O2 kill bacteria? Hydrogen peroxide is H2O2, meaning it contains one more oxygen molecule than water, whose composition is H2O. When hydrogen peroxide is put on a cut or scrape, we notice some bubbling from the area, as the hydrogen peroxide releases one oxygen molecule and becomes water. Bacterial cells are broken by hydrogen peroxide (by attracting electrons) and catalase, the enzyme found inside bacteria, reacts with the hydrogen peroxide which releases one oxygen molecule, causing the fizzing we see. This study, published in 2017, describes the mechanisms through which ROS, H2O2 included, help in healing a wound. Is there H2O2 in honey? gluconolactone and hydrogen peroxide, which would be of effect only during the ripening of honey, because a full-strength ripe honey has an almost undetectable level of hydrogen peroxide. So, we can say there is no H2O2 in honey and the enzyme oxidase remains inactive in ripe honey, due to its very low pH. But when honey is diluted, as it happens when enters in contact with the body fluids found in an open wound, the enzyme is activated and H2O2 is produced. On dilution the activity of oxidase increases by a factor of 2500-50 000. When honey is applied on a wound, burn or other skin infection, the serum from the tissues dilutes the honey and raises its pH, also adding sodium and ultimately activating the enzyme oxidase. Thus, small quantities of hydrogen peroxide are produced little by little directly on the wound, making honey a perfect, slow-release antimicrobial product for treating wounds. Can’t we simply apply hydrogen peroxide on the wound? We can but is not efficient. It was something that was done in the past. Hydrogen peroxide (H2O2) is an efficient disinfectant effective at killing bacteria, used since the 1920s and still available in drug stores everywhere. The big problem is that most cells in the body contain catalase (just like bacteria do), so when the tissue is damaged, the enzyme is released and becomes available to react with the peroxide we put upon. The peroxide will attract electrons from the healthy cell membranes too, killing them, and then will react with the catalase, producing the same fizzing. Thus, excessive oxidative damage to our cells from external hydrogen peroxide will slow wound healing and increase the risk of scar formation. In honey this substances is stable and is released little by little, a fact that makes it superior to being simply applied on the wound, on its own.
! Not only the capacity of producing H2O2 is what makes honey antibacterial, but all the other factors listed above, such as low pH, acidity, low water content, high sugar content, high osmolarity, antibacterial aromatic acids, phenolics and flavonoids and so on. Honey works differently from antibiotics, which attack the bacteria’s cell wall or inhibit intracellular metabolic pathways. In 2017, the NHS through Public Health England’s guidance on common infections officially recognized Reactive Oxygen® wound gel (SurgihoneyROTM) as a treatment for venous leg ulcers to reduce bacterial load and infection, explaining it could cut antibiotic use. Are all medical grade honey as efficient in killing bacteria? No. Due to their different mechanisms of antibacterial activity some of them are more effective on Gram positive bacteria, others on Gram negative bacteria. What bacteria can Surgihoney kill? The producer says that this topical wound gel destroys all Gram-positive and negative bacteria tested to date, including MRSA, Pseudomonas aeruginonsa and Esherichia coli. It also prevents and disrupts the build-up of bacterial colonies, or biofilm, linked with chronic infection in vitro. 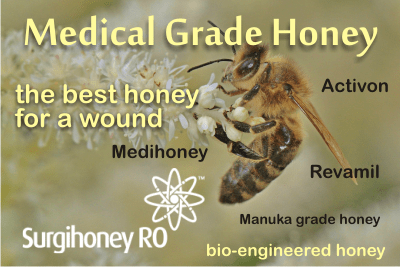 To see what bacteria Revamil honey (which has peroxide activity) can kill versus what bacteria Manuka honey (with MGO activity) can kill, please read Revamil medical grade honey. Comparison to manuka honey. Plenty of them. Here are some of them. • Two further clinical evaluations of its use in the prevention of surgical wound infections are underway, including one at University College London Hospital. • A separate pilot study showed SurgihoneyRO™ could reduce infection rates associated with cancer patients receiving chemotherapy through intravenous lines – even those colonised with Carbapenem-resistant Enterobacteriaceae (CPE), a Gram-negative bacteria resistant to the carbapenem class of antibiotics, considered the drug of last resort for such infections. What is beechwood honey? One premium honey from New Zealand. Why can’t you give honey to babies?